You can purchase Resistance here directly from Inkstained Succubus (support small presses!) or here from Amazon. 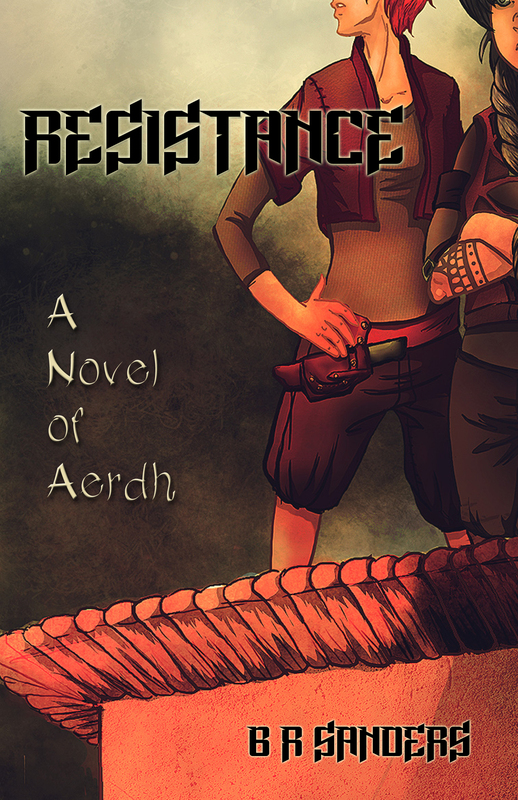 Resistance is set in the secondary fantasy world of Aerdh, which to date is where most of my writing is set. I consider myself a digressive writer; by that I mean that my ideas for new stories are inspired by the one’s I’ve already written or am currently writing. The stories I write become nest, tangled and interrelated. One way this happens is by cameos. Sometimes when I’m writing a minor character springs to life. Sometimes, they demand their own stories. This is, actually, how Resistance was born: Inkstained Succubus put out a call for self-rescuing princesses, and I knew a pair of tertiary characters who’d appeared in a few unpublished works of mine were due for their moment in the spotlight. I wrote a short story—“Proof”—about them. The anthology I wrote “Proof” for didn’t pan out, but Inkstained Succubus did me the great honor of requesting that I give Shandolin and Rivna and even brighter spotlight: their very own novel. Maybe you’ve read Resistance and maybe you’d like to see more of some of these characters. Due to my digressive writing style there’s only a handful of people in the book who only appear there. A Tale of Rebellion, a series of novels I’m currently mired in the middle of, features some pretty prominent cameos from our friends in Resistance. These books are just a couple of years after Resistance, and there is a meaty section in the first book, Extraction, which takes place in the City of Mages. There, we meet again Shandolin, Rivna, Moshel and even Velo and Po. Kel plays a prominent role in Extraction, appears again in its sequel (The Incoming Tide) and is shaping up to be a major character in the third book in the series (The King and His Makers). Some characters even have their own short stories all to themselves. Moshel Atoosa’Avvah is the lead in “Matters of Scale”, a short story of mine currently in submission and open to beta readers. Rivna’s father, Pahvo, gives readers a glimpse of what life is like from his perspective in “Blue Flowers,” a short story included in Crossed Genres’ Fierce Family anthology. Even the City itself appears again. For insight into what the City of Mages looks like quite a few years after the events of Resistance, you could check out “The Other Side of Town,” currently available to read for free over at Redhead Ezine. This entry was posted in A TALE OF REBELLION, B's Novels, B's Short Fiction, BLUE FLOWERS, EXTRACTION, Inkstained Succubus Press, MATTERS OF SCALE, RESISTANCE, THE OTHER SIDE OF TOWN, Writing is a Process and tagged b r sanders, book release, fantasy, inkstained succubus, lgbt fiction, new release, Resistance by brsanders. Bookmark the permalink.